Jack Harbaugh, the patriarch of the NFL's reigning first family, was in coaching trouble back in the mid-1990s; his Western Kentucky program was skidding through repeated losing seasons, and Jack's future was tenuous. That's when his sons, John, then an assistant at the University of Cincinnati, and Jim, then a high-profile starting NFL quarterback, made it their unprecedented mission to moonlight and save him. 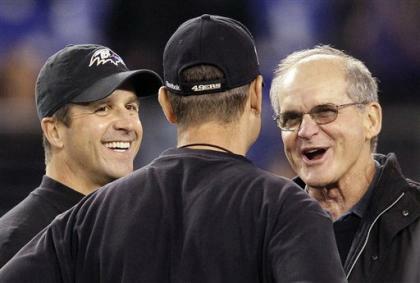 On Feb. 3 the brothers meet with a Super Bowl on the line – John's Baltimore Ravens against Jim's San Francisco 49ers. Not two decades ago they teamed up to help their dad and in the process built the foundation for a championship program – in this case at a lower-division college that neither even officially worked for at the time. 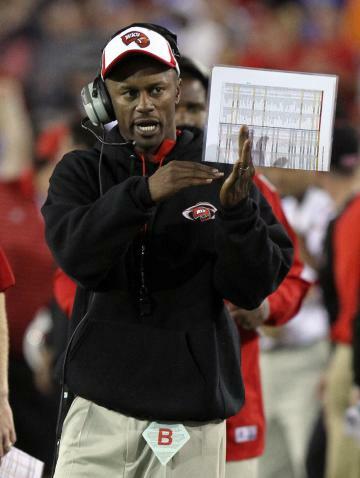 In 1994, WKU suffered its fourth losing season in five years under Jack Harbaugh. No one ever doubted Jack's ability to coach. He clearly needed better players, though. Enter the Harbaugh brothers, both big-dreaming workaholics looking for a side project. The plan was simple: Jim owned a home in Orlando, the heart of one of the most talent-rich recruiting areas in the country. So he became an NCAA-certified volunteer assistant coach for WKU, which allowed him to recruit. John, meanwhile, leaned on the scouting services, deep contacts and endless high school game footage they had at Cincinnati, which as a Division I-A school had a far larger budget than Division I-AA Western Kentucky. After NFL seasons, John would supply a list of potential hidden gems along the Interstate-4 corridor in Central Florida that, while not right for Cincinnati, could be great for WKU. Jim would pay them a visit and use his stature as an active NFL star to talk up a little known school in Bowling Green, Ky.
That's how Willie Taggart came home one day from track practice at Bradenton (Fla.) Manatee High School and got a message from his sister. "She told me a guy by the name of Jim Harbaugh called," Taggart said. "I was like, 'What?' "
Manatee High was a football powerhouse at the time. It was the school that had recently sent Tommie Frazier to Nebraska and at that time featured the state's Mr. Football, Shevin Wiggins, who would also sign with the Cornhuskers. Taggart was the starting quarterback, leading the team to a state title as a junior. Yet few coaches envisioned him playing QB at the collegiate level. Nebraska and Tennessee, among others, were recruiting him primarily as a defensive back. What Taggart couldn't really understand was why an NFL starting QB was calling him. So he called him back. "I said, 'the only Jim Harbaugh I know plays for the Chicago Bears. [Harbaugh may have been an Indianapolis Colt by that point.] He said, 'Yeah, that's me.' I was like, 'yeah, right.' "
Harbaugh explained he was trying to round up some talent for his dad's program. He told Taggart that he and his father were watching tape of Manatee and asked, "Who is that little skinny guy?" Jim said he thought he should play quarterback in college and he'd come by the school on Tuesday at lunch to discuss it further. Taggart hung up and assumed it was a prank or something. "I called my high school coach and he checked on it and said, 'Yeah, Jim is Jack Harbaugh's son.' I told my coach, 'Well, he's supposed to be here Tuesday at lunch.' And sure enough, Tuesday at lunch Jim Harbaugh walked into the cafeteria. "I thought I was the big man on campus. I've got a NFL quarterback coming to see me." Later, Jim visited Taggart and his family at their home. "We were out in backyard throwing the football around and people are riding by yelling, 'Hey, Jim Harbaugh!' " Taggart said. "They were coming over for autographs. He was talking to everyone." The recruitment was essentially done. Harbaugh, Taggart said, had a way of making an instant connection. "The moment you met him you felt like you knew him for years. "After I met Jim, and then Jack, I was like, I want to be around these guys." The big-name schools were out and Western Kentucky had its quarterback of the future. Taggart would go on to become the starter as a freshman in 1995 and finish his career with 3,997 yards rushing (then an NCAA record for QBs) with 47 touchdowns on the ground and another 30 through the air. He also was the start of an onslaught on Florida talent headed to Western Kentucky, corralled by Harbaugh brother teamwork. It included unheralded recruits who would one day even reach the NFL such as Bobby Sippio out of Kissimmee, Mel Mitchell from Rockledge and Rod Smart, also known as "He Hate Me," from Lakeland. "John gave Jim a list of names in Florida and Jim came out and recruited us, school by school," Taggart said. The direction of the entire program changed. "We went 2-8 my freshman year and then started a run of 10 consecutive winning seasons," Taggart said. Jim later expanded his recruiting turf to Indiana, where he played for the Colts, was popularly known as "Captain Comeback" and had his own TV show. Back in 1996 he told reporters about winning NFL games on Sunday and touching base with Indianapolis high schools as a college recruiter on Monday. 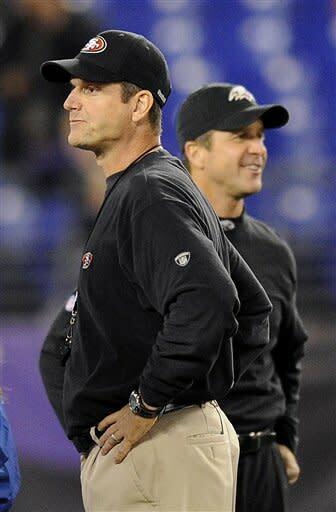 "I called the coach at Warren Central [High School] last year after we beat Miami,'' Harbaugh said at the time. "I introduced myself and asked if he had any prospects. There was quiet for a moment, and then the coach said, 'Yeah, and I'm Mike Ditka.' "
In 2002, the program peaked with the Hilltoppers winning the Division I-AA national championship. Jim was credited with signing 17 of the players on that team. Not bad for a volunteer. Jack, who finished his career on a 61-24 streak, retired from coaching after winning the title. Jim called it quits as a player the same year and became a low-level assistant with the Oakland Raiders. By then John was an assistant with the Philadelphia Eagles and out of the high school prospect business. Meanwhile, WKU seized the momentum and kept growing. In 2008, it transitioned to Division I-A. And in 2010, it hired a new head coach … Willie Taggart. Taggart remained close to the family after graduation. He calls Jack and wife Jackie his second parents. He was part of the wedding party in Jim's wedding and Jim served as his best man. When he needed a break in coaching, it was John – then an assistant with the Eagles – who got him an internship in Philadelphia. He was an assistant coach for Jim at Stanford when WKU hired him. "Ever since I met Jim Harbaugh that day in the cafeteria my life has gone nowhere but up," Taggart said. "He's been my role model. And he showed me the blueprint to recruiting, coaching and building a program." In some ways, it's a familiar blueprint. After three years at WKU, including consecutive seven-win seasons, Taggart was hired in December to resurrect the University of South Florida, a Big East program in Tampa. His recruiting focus now is the school's backyard: that same I-4 corridor the Harbaugh brothers targeted as a way to save their dad's program all those years ago.